Under the strict Islamic law, women are not supposed to show their skin or faces to men outside the family; in fact, they shouldn’t even be in the same room with or talk to men outside the family. Even though working is allowed, workplaces where women can work in accordance with these strict laws are extremely limited. We decided that by establishing a women-only plant where Saudi women can work without coming into contact with men, Unicharm could support women’s social advancement while respecting their cultural practices and religious views. From that idea, a new Unicharm production site was established in Saudi Arabia in May 2012, the first plant of its kind. Saudi Arabia, the home of the holy city of Mecca and known as being a strictly Muslim country, now boasts a women-only plant in its capital city of Riyadh. 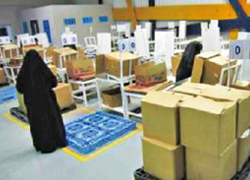 The efforts we made were not limited to making the production areas where women work off-limits to men, but included the creation of a delivery location that is separated by shutters, to accommodate the situations in which female employees need to interact with men, such as delivering documents and products. We expanded the employment of women in the office as well as in the production site in 2013, to continue supporting women’s employment. Furthermore, to create even more employment opportunities, we established a stay-at-home work system for persons with disabilities. Even in a social environment that places many restrictions on women’s lives, we want to offer help and support for women to make social advances; with our women-only plant in Saudi Arabia, one of our hopes has been realized and continues to make progress. (black over-garments) for the photo shoot.